If you have read Dr Levinson’s bio you will note that he was a consulting specialist at the Zoo for a time. Read on for his tiger tail – I mean tale…. 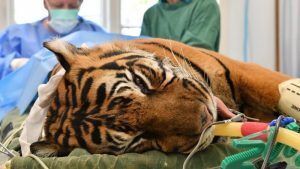 The Royal Melbourne Zoo has a wonderful reputation for the quality of care it provides to its residents under the auspices of Dr Helen McCracken – Senior Veterinarian for 25 years. I was lucky enough to be invited to join the team of visiting dental specialists by my friend Dr Steven Coles, who was one of the first veterinarians to obtain a degree in veterinary dentistry in the 1980’s. 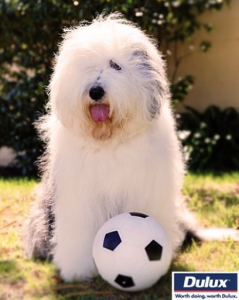 There was, of course, little opportunity for orthodontic treatment at the zoo, although Steven and I had, in the past, treated a few dogs with bite problems, including the Dulux Old English Sheepdog. On one occasion, Helen decided that we would give one of the new tigers a routine dental check-up. Both large and domestic cats suffer from a rather unusual condition called feline odontoclastic resorption syndrome (FORS) where the teeth are literally eaten away by cells in the gum. It is a very painful condition for the cat and usually results in the loss of the affected teeth. My wife and I have owned Burmese cats for 35 years and we were very familiar with this condition. So off I went with Helen to ‘get’ the tiger from its enclosure. Now, it should be said that I consider Helen to be one of the most capable and committed professionals I have ever had the pleasure to meet, and I had absolute trust in her judgement. However, driving through the back roads of the zoo to fetch a tiger for a dental check-up was enough to fill me with a sense of abject fear and trepidation. We arrived at the cats’ enclosure to find the tiger asleep on its perch. Helen produces, from nowhere, a dart gun and instructs me to rush the animal before it falls unconscious to the ground. With that, she fires the dart into the cats’ hindquarters and within 2 minutes, the animal starts to lose consciousness. ”Go” she commands and we rush the animal to catch it before it falls to the floor. Clearly, physics was not Helen’s forte, otherwise she would have determined that a 200 kg cat falling from a perch 2 metres high was no match for two rather diminutive individuals. With the assistance of a couple of zookeepers, we placed the animal onto a stretcher and we loaded her into the back of a microvan. There is nothing I have experienced in my life that compares to the awe one feels when close to these magnificent creatures. The sheer size, beauty and raw power of these cats is breathtaking. Fortunately, the procedure went well, and I am pleased to say the cat received a clean bill of health. A very different outcome from my Burmese cats who have gone on to lose a number of teeth over the years to resorptive syndrome. If you have a cat, especially an oriental, please consider having their teeth checked regularly for this condition. You can spare you furry friends a great deal of dental pain by treating this often hidden disease.